The modcloth one is even nicer than the anthropologie version! Love it. The material looks less likely to wrinkle and if there's anything that can completely ruin a cute outfit, it's wrinkles. I like the Anthro version of the skirt, even though I'm not fond of either skirt, really. I think I can grow to love them, though. The cheaper version is definitely nicer. I'd go for that. Wow, these are ridiculously similar! I like the Antro skirt more. I actually like the ModCloth one a little bit better,so I would go for that one. Great find, Erika! I actually like Modcloth better..it seems much neater. That is such a cute skirt! Loving the nautical vibe. 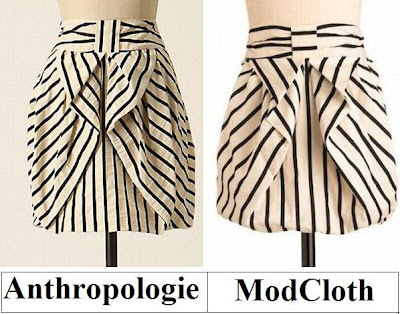 I've been OBSESSED with that Anthro skirt for such a long time -- your Modcloth find is spectacular, dear! i tried this on a couple months ago at Anthro and looooved it but couldn't bring myself to spend the money! thanks for finding it on modcloth, you're amazing!! I like the more streamlined modcloth look more anyway! Considering I already bit the bullet a long time ago - the Anthro version is the one I have. I think the ModCloth version is a great affordable alternative but worry how short it is. I can actully wear mine to work - it's long enough. Happy Sunday Ericka! I like the modcloth one better this time! Love this skirts! 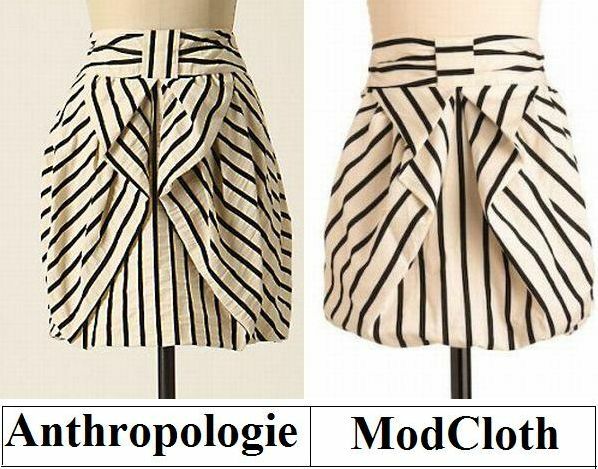 And since it is basically the same exact skirt I will definitely buy the Mod Cloth one! Again, how do you find these?! I actually prefer the ModCloth one b/c of the crinkle-free material. Super adorable and chic skirt. Hope you are having a fab weekend! I actually prefer the Modcloth one. I think this would be a really fun skirt to layer up with some tights and really chunky boots. i think i prefer the modcloth skirt!! ahh i can't wait to get to the US to shop at Modcloth!! cool and thrifty!! they are so similar. although i love anthro.. 128 is a lil much! I'm going for Modcloth. I love it more. love them! have a nice sunday! Don't you just love cheaper look-alikes?? This skirt is so my style too! I bet the cheaper version is going to sell right out!! Ooooooh gorgeous skirt, darling E! definitely thrifty! the mod cloth one looks better! I love the shape of the skirts! They're adorable. I definitely prefer the Modcloth one though. Really so unique. Mod Cloth! for me. both are great but I love the anthro one a bit better! the mod cloth version all the way! I'd definitely get the Modcloth. Both skirts are adorable though! Both are great and nobody would be able to really tell the difference I'm sure. Haha, cute skirts, but they really do look the same! I guess I would go for the more affordable Modclothe then! Sweet -- kind of little girl-ish but grown up. I actually like the Modcloth version better and I'd definitely have fun wearing it with something simple on top and maybe a sparkly pair of sandals! Great picks!! Love Anthropologie!! Visited the store yesterday and if I could buy the whole store, I would :) However, your cheaper alternative is right in my price range!! Oh my goodness, I LOVE this skirt! fabulous!! modcloth one looks more gorgeous i think ? I think the modclothe one is actually the better looking of the two. Hope you had a great weekend. That Modcloth one is perfect Erika! I love stripped skirts as it is, that is so cute! Alas , I must listen and ignore the brand name. Remind me of Viv's creation! Gorgeous find! Thank you for the comment love!!! definitely prefer the modcloth one. thanks for pointing it out. Love these kinda posts, splurge or steal! I'd go for the Anthro but yes for much less money, I'd probably go home with Modcloth in reality! ohhh both great, you can barely tell them apart! Something about the Anthro one speaks to me more...but they're both pretty freaking fabulous!